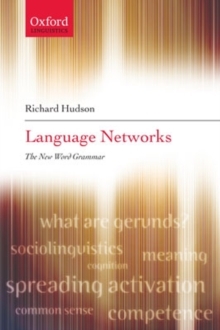 This book argues that language is a network of concepts which in turn is part of the general cognitive network of the mind. It challenges the widely-held view that language is an innate mental module with its own special internal organization. It shows that language has the same internal organization as other areas of knowledge such as social relations and action schemas, and reveals the rich links between linguistic elements and contextual categories. Professor Hudson presents a new theory of how we learn and use our knowledge of language. He puts this to work in a series of extended explorations of morphology, syntax, semantics, and sociolinguistics. Every step of his argument and exposition is illustrated with examples, including the kind mainstream theory finds it hard to analyse. He introduces the latest version of his influential theory of Word Grammar and shows how it can be used to explain the operations of language and as a key tounderstanding the associated operations of the mind.